The first 75 registrants will receive a $10 discount! ​Please email if you need a scholarship - see below for details. The program will begin Friday night with an introduction to the topic and the benefits of studying it. The introduction to the program is open to all, no registration required. 12 hours and 30 minutes total of seminar time split evenly over two days. Weekend sessions run from 10am to 6pm. Time will be divided between riwaya (narration) in Arabic and english, explanation of highlighted hadith, and Q&A. Ample break time will be provided for lunch and Dhuhr prayer and for nasheed (poetry recitation) on the love of the Prophet ﷺ. Let others know you are attending, stay updated on details & the latest info about the course including who else is coming by joining the FaceBook Event Page. ​Please help spread the word of this beautiful gathering - Download the flyer. We need your help! Want to be part of having a hand in this blessed gathering? Email us to join the team. There also some perks that come with becoming a volunteer. The book we will be studying is Shaykh Ibn 'Arabi's classical work "Mishkat Al Anwar" (The Niche of Lights). A quality translation is available here as hardcover/paperback. It is also available as a PDF in English or Arabic. ​The Arabic hadith with the translation will be projected clearly during the event. ​Munshids Ibrahim and Mouaz al-Nass, the son of Shaykh Samer al-Nass will be joining us for the intensive. They will be singing beautiful words of poetry and praise of the Prophet ﷺ during break sessions. Complementary light refreshments will be provided. Lunch will not be provided, but there are plenty of nearby tasty zabiha options to chose from for lunch. 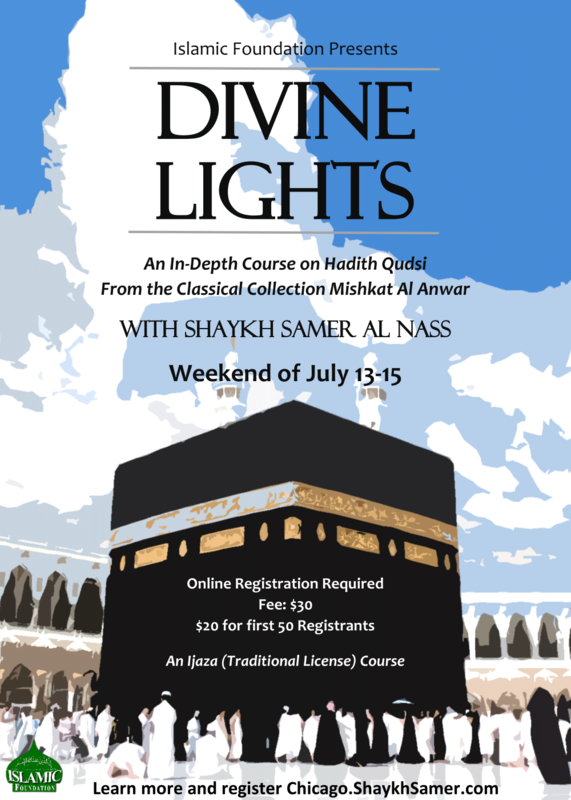 ﻿A Traditional License, or Ijaza, signed by Shaykh Samer Al-Nass will be provided to registrants who attend the course in its entirety. Attendance will be taken and a sign-in sheet will be maintained for those who are interested in the Ijaza. Click here to read more about the role of Ijaza in Islam and see an example.